That doesn’t mean, however, Bernier has a lock on the leadership. Saskatchewan MP Andrew Scheer, the former speaker of the House of Commons, has emerged as his leading alternative, though a handful of Ontario-based candidates lingering in third place could ultimately determine the outcome — or emerge as compromise candidates themselves. Tories have effectively lacked a permanent leader since the September 2015 election. Former prime minister Stephen Harper, the only leader the party has known since the 2003 merger of the old eastern-based Progressive Conservatives and the western-based Canadian Alliance, stepped down immediately in the aftermath of that election, which brought the center-left Liberals to power under Justin Trudeau. Over a year and a half later, Trudeau is still broadly popular, but his honeymoon is ending. Most polls still give the Liberals a lead, Trudeau annoyed many of his core voters by backtracking on a campaign pledge to reform the Canadian electoral system (currently first-past-the-post across 338 ridings nationwide). Even more voters disliked the government’s budget earlier this spring, which increases alcohol taxes and eliminates a popular public transit tax credit. Trudeau and the Liberals hold a firm majority, and they have no obligation to call another election until October 2019. The progressive New Democratic Party, which once led polls to win the 2015 election under Thomas Mulcair, will hold a leadership election in October of this year. US president Donald Trump’s willingness to pick fights with Canada over softwood lumber, dairy exports and renegotiation of the North American Free Trade Agreement could upend the traditionally tranquil relationship between the two countries, greatly disrupting Canadian domestic politics. But while the next election is far off, Tories are clearly looking for a champion who can claw their way back to government. 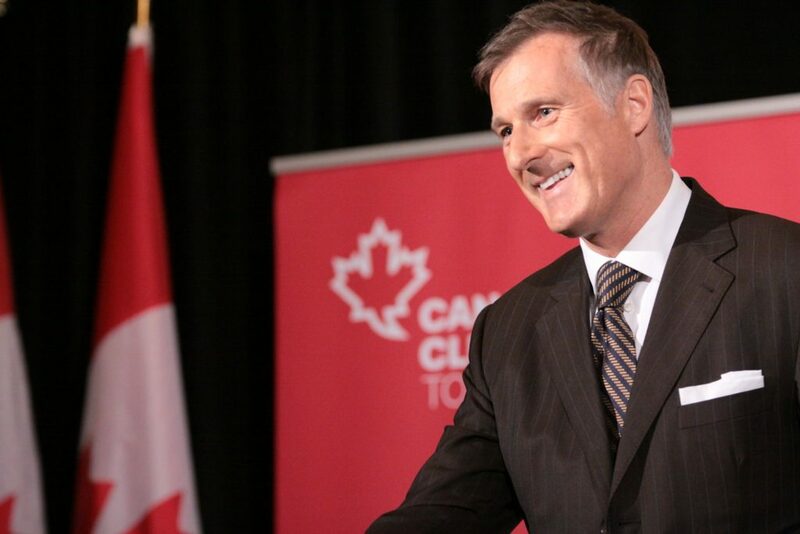 Since 2006, Bernier has represented the Quebec riding of Beauce, and he held several ministerial posts in Harper governments, most recently as minister of state for small business and tourism from 2011 to 2015. He served briefly from August 2007 to May 2008 as minister of foreign affairs, but was forced to resign after he inadvertently left government documents at the home of his then-girlfriend. It was an early embarrassment in Bernier’s career that he’s worked painfully to transcend. Generally, the 54-year-old Bernier has a libertarian worldview — he’s more socially liberal than Harper, especially on drug legalization, but also far more fiscally conservative. That’s led him to take some divisive positions, such as his commitment to end supply management, which puts him at odds with fellow Conservatives as well as Liberals and New Democrats. Bernier’s opponents last week mocked him for taking Trump’s position, not Canada’s, on trade disputes. Under Canada’s long-term supply management policy, national governments have used a combination of (i) tariffs and other protectionist measures, (ii) artificial control of supply and (iii) price-setting to stabilize the price of dairy, eggs and poultry in Canada, guaranteeing profits to farmers (though increasing prices for Canadian domestic consumers). Governments have used similar measures to boost the softwood lumber industry. 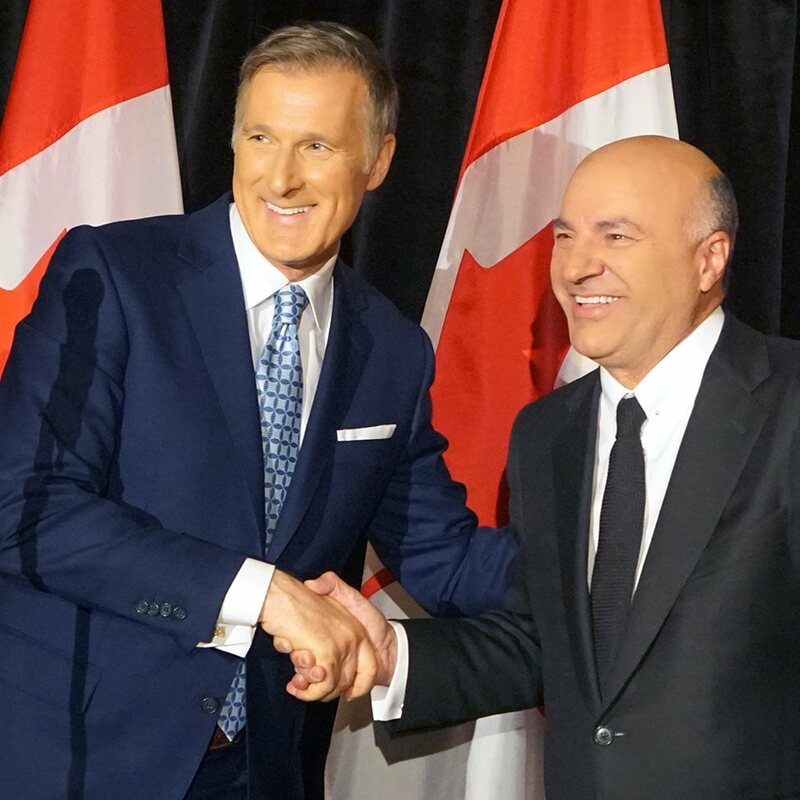 Bernier (and O’Leary) obviously believe that the path back to power winds through Quebec, the second-most populous province in Canada. Though Bernier comes from a well-known political family in Quebec (his father Gilles Bernier served as a PC/independent MP from 1984 to 1997), it’s not clear Quebeckers, traditionally more left-wing than the rest of Canada, will cuddle up to Bernier’s libertarian approach to politics. Moreover, the Tories won minority governments in 2006 and 2008 with just 10 (out of 75) seats in Quebec and a majority government in 2011 with just five Quebec MPs. In the 2015 election, the worst Conservative performance since 2004, the Tories managed to win 12 seats in Quebec (higher than at any time since 1988, when Brian Mulroney’s PCs took 63 seats in the province). But in modern Canadian history, the path to Tory victory has run through Ontario and the western resource-rich provinces — not through Quebec. Though Bernier is a Quebec native with strong roots in the province, Quebec voters may not warm to a Conservative leadership that wants to reduce government’s role so sharply and eliminate longstanding protections for Quebecois farmers. Though Bernier may have a lock on support of Quebec’s conservatives in the 2017 leadership race, there’s no guarantee that he’ll win over Quebec’s voters in the 2019 general election. 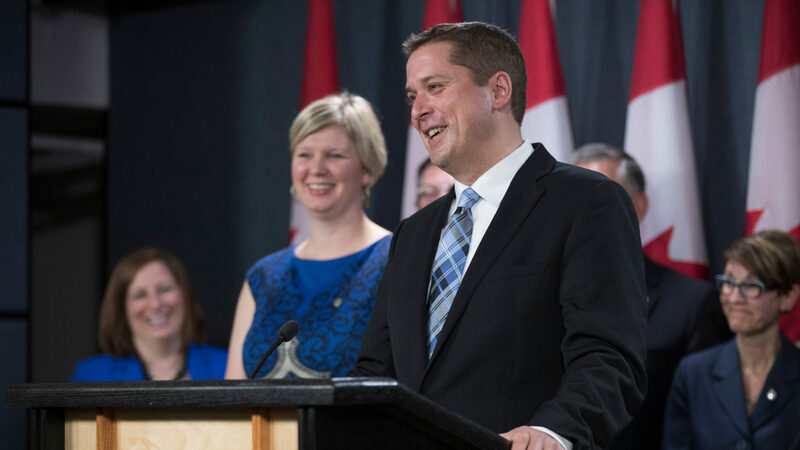 Scheer, at just age 37, has represented a Regina riding since 2004, and he served as the speaker of the House of Commons in the final Harper government. Like Harper, Scheer comes from the western prairies and from the socially conservative Canadian Alliance wing of the party. He’s more genial and soft-spoken than Harper, however, and he already has the support of 24 MPs in the House of Commons. Scheer, as a native of Saskatchewan, has kind words for the province’s three-term premier, Brad Wall, who leads the province-level Saskatchewan Party (a merger of conservatives and centrist liberals), and who might be Canada’s most effective conservative leader in power today. Wall, a pragmatic small-c conservative, declined to run for the Tory leadership, despite polls that show he would have been a top contender. He hasn’t formally endorsed Scheer (or anyone) for the federal Conservative leadership, but he has worked closely with Scheer in the past. Scheer’s path to victory depends on voters seeing him as a big-tent Tory who, like Harper, can unite the two wings of the party and who, like Wall, can win over centrists with a relatively generic pro-business conservatism that avoids controversial drama. Born in Ottawa, Scheer is fluent in French with far more ease than Harper ever displayed. Chris Alexander, former MP for Ajax-Pickering (in Toronto’s eastern suburbs), a diplomat who served in the 2000s as Canada’s ambassador to Afghanistan and from 2013 to 2015 as citizenship and immigration minister. 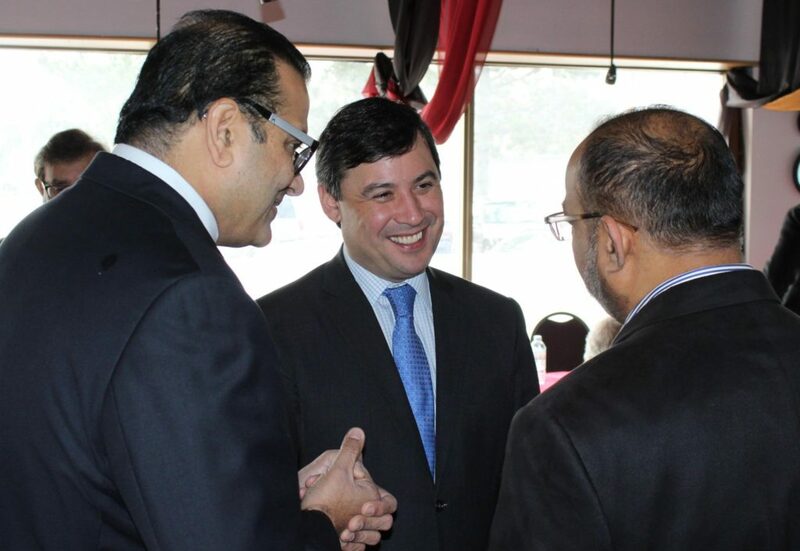 Michael Chong, MP since 2004 for Wellington-Halton Hills (in midwestern Ontario just outside of Toronto), the son of immigrants, a progressive Tory who has served as minister for sport and intergovernmental affairs and youth and the party’s strongest advocate of a carbon tax to reduce emissions. Erin O’Toole, MP since 2015 for Durham (northeast of Toronto), a former minister of veterans affairs who came to politics after a decade of service in the Royal Canadian Air Force, who commands more support from sitting Tory MPs than any other leadership candidate and is generally seen as the likeliest dark-horse compromise candidate. Lisa Raitt, MP since 2008 for Milton (previously Halton, another riding in the greater Toronto area), who served in several ministerial positions under Harper, including transport, labour and natural resources. 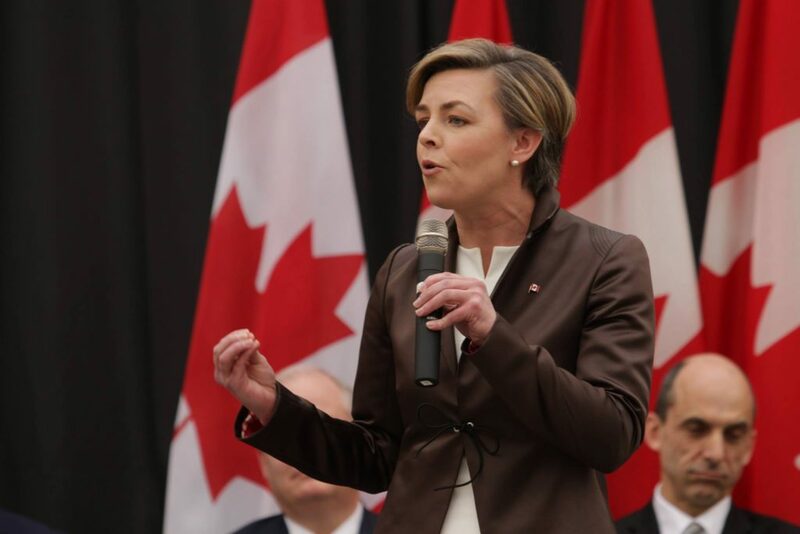 Leitch is among the top fundraisers in the leadership race, and she vaunted into the contest’s top tier after Trump’s election as US president last November. But she has stalled, given her divisive line on immigrants. Canada has one of the world’s largest foreign-born populations (nearly 20% of all Canadians today and around 50% of all Toronto residents), higher than immigration rates in much of the European Union or the United States. Chong’s carbon tax proposal has made him an unpalatable choice for fiscal conservatives, especially those in western Canada, where oil and gas are particularly important for economic growth. O’Toole and Raitt are more likely to emerge as consensus candidates, though they both struggle with the French language, unlike Scheer. As votes are tallied, as candidates are eliminated and as their supporters are redistributed to other candidates, the second-choice and third-choice preferences of the supporters of these Ontario MPs will become increasingly important. Voting among party members began on April 28, and the results will be announced on May 27. Each voter will rank their choices. As each candidate with the lowest support is removed after each ballot, their votes will be redistributed to their supporters’ second choice, third choice and so on — until a candidate wins an absolute majority. One wrinkle, however, is that the ballots are weighted to equalize each of Canada’s 338 ridings, such that each riding is worth 100 points and a candidate must accumulate 16,901 points (50% plus one) to win the leadership. That has two effects that could skew the result. The first is that the average Quebec party member (across 78 ridings) will have more weight than the average Alberta party member (across 34 ridings), even though Tories are far more dominant in Alberta. Moreover, any candidate who can unify Ontario conservatives (across 121 ridings) will stand a good chance at winning the leadership outright. For now, however, with so many Ontario MPs bunched up in third place in most polls, this effect is boosting Bernier, who commands majority support from among Quebec’s conservatives. The second is that the next leader will have to secure 50% or more of the vote. That means that candidates with controversial views, including Bernier (economics and trade policy), Leitch (immigration) and Chong (carbon tax) may struggle in ballots to reach an absolute majority. This aspect of the contest boosts Scheer, as the leading compromise candidates, but also, perhaps, Raitt or O’Toole, as other Ontario contenders are gradually eliminated.